Who would’ve thought getting into thekitchen would get you into a V8 Supercar? My Kitchen Rules contestant andlong-time fan Craig was given the opportunity of a lifetime at Symmons Plains yesterday. 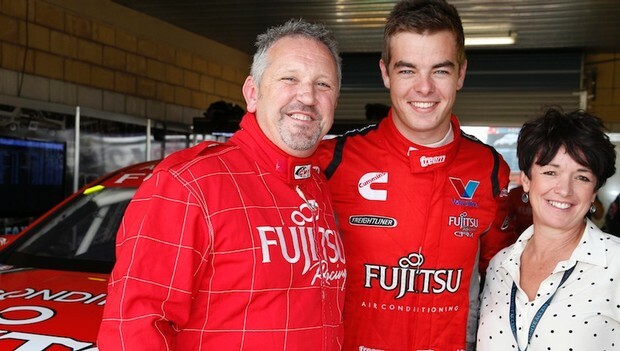 In the hot seat with rookie ScottMcLaughlin, Craig was excited about the lap – it didn’t hurt that the Fujitsu RacingGRM driver was fourth quickest overall in yesterday’s Practice and has come offthe back of his first race win at non-championship event, the Australian GrandPrix. Husband and wife cooking team Craig andKerrie were both at the track, and while Kerrie had the chance to spend timewith Jack Daniel’s Racing and check out the food tent, it was Craig who hoppedin the passenger’s seat. He enjoyed the track’s signature hairpinturn and felt nothing but awe for the series drivers. “I knew it’d be hard braking there, but youcan feel yourself going forward into your seatbelt. Who would have thought a love for cookingwould lead to such opportunities? “I’m really appreciative of it,” Craigsaid. The MKR pair had a taste of what thedrivers experience every race weekend, with an autograph signing session thatmorning. “Today at the signing the kids were so excited! It was a really goodfeeling. The show touches a lot of people and we had fun. MKR airs on Channel 7 with a specialscreening on Sunday at 6.30pm.